Quality, design and technology: BORA Classic makes even the most personal cooking and kitchen dreams come true. BORA Classic impresses with a streamlined appearance and small installation dimensions; a compact cooktop extractor system, freely combinable with several cooktop types. Available as re-circulation or exhaust air models; the high levels of innovation and functionality coupled with an attractive design are also appreciated by international specialists, who awarded the BORA Classic the red dot product design award. Intuitive sControl+ control: The unique operating panel is simpler than ever: it works intuitively with a swipe of your index finger up or down in the smooth hollow, or a tap with your fingertip. All important functions can be accessed with a single touch. Minimum volume: Always extremely quiet - even on high power levels: this is due to optimum airflow and the use of an extremely quiet fan in the kitchen plinth area. So it will not distract you from your cooking and your conversations will not be disturbed. Simple cleaning: All parts that come into contact with cooking vapours can be easily removed through the accessible, wide inlet opening. They can then be cleaned in the dishwasher, where they take up very little space. Oversized 4 24 cooking surface: Thanks to the central operating panel by the extractor, no space is taken up by controls on the cooktop and there is room to cook with 4 pots measuring up to 24cm at the same time. Modular system: BORA offers a wide range of cooktops, from surface induction to gas cooktops or Tepan stainless steel grills, which can be freely combined with the extraction system. Combinations of one, three or more cooktops are also easily achievable. 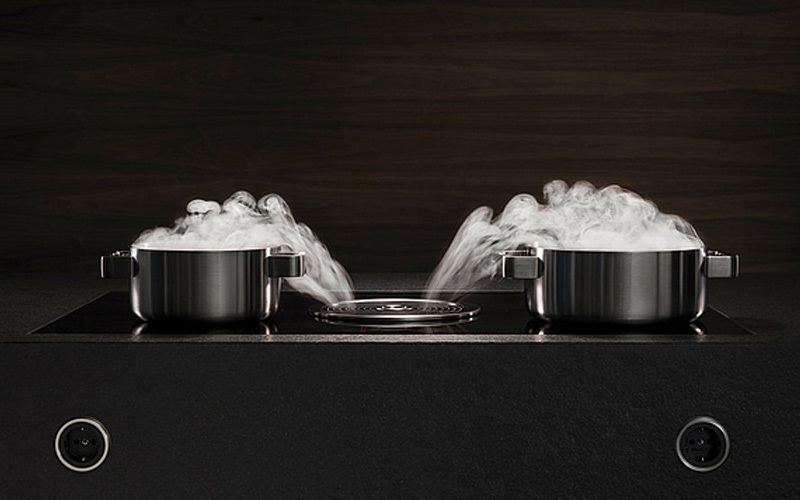 Minimalistic design: The cooktop and extractor are ideal for flush installation. The perfect lines allow them to blend in discreetly and elegantly with any modern kitchen design. When on standby, the operating panel is virtually invisible and during operation it is scaled down to the essentials thanks to intelligent lighting. Automatic extractor control: The extractor power level automatically adjusts itself according to current cooking conditions. There is no need for constant manual adjustment, which means you can focus fully on your cooking. Accurate temperature control: The Tepan stainless steel grill offers top performance, 2 large grill areas and unique, precise temperature control. The required temperature can be set directly and is accurately displayed and maintained. Rapid heating to 250°C in under 5 minutes saves time and energy. We have a fully functioning BORA Classic cooktop on display at Burlanes Chelmsford. Please pop in for a demonstration and to try it out for yourself, or call us to chat with our team of professionals.